The NEW Emergency Response Mobile app from Atlas-Apex Roofing Inc. has been specifically designed to make it fast, simple, and convenient for customers to get the help they need to solve their commercial roofing problems and maintain their valuable asset over the long term. Emergency Service The Emergency Response Mobile app from Atlas-Apex Roofing Inc. provides a direct link to our service dispatch team, to quickly and efficiently assist you with any urgent roof issues that require immediate attention. The large “Emergency Service Request” button in the center of the screen says it all. Next Day Service In addition, the Emergency Response Mobile app also handles all non-emergency requests, for planned roof services such as preventive maintenance, inspections, repairs or alterations. The “Next Day Service” button allows you to easily submit this type of request. Service History The “Service History” button gives you access to a full history of all service requests submitted through the Emergency Response Mobile app. You can access all of the important details, including the time and date, facility and contact information, type of request, the person who requested the service, and any notes added by the user. Stores Contact/ Facility Information The Emergency Response Mobile app saves your basic contact information and the details of your facility(s) on your device, so that customers with multiple service requests and/or multiple facilities only need to enter the information for each facility once. Multiple Devices per User For anyone using multiple mobile devices, all information within the app is automatically synchronized between devices, so there’s never a need to update every device manually. About Atlas-Apex Roofing Inc. 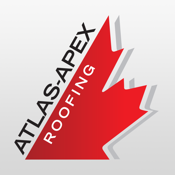 Founded in 1928, Atlas-Apex Roofing Inc. is the premier provider of Industrial/ Commercial/ Institutional roofing contracting services across Canada. Our dedicated team of over 350 roofing professionals provide our customers with industry-leading workmanship and customer service, to expertly handle any roof problem of any size. From small roof leak repairs to complete system replacement –and everything in between, Atlas-Apex Roofing ensures the work is done on time, on budget, and to your complete satisfaction.